It has been three decades, thirty years or 10,950 days. However you look at it, Bob and I have married for a long time. One question people often ask is how have been able to stay together for thirty years, the list of answers is lengthy. It’s a subtle distinction, but the more I thought about it, the more my heart agreed; it’s not a love story, it’s a story of love. How does one share a long story of love without putting you, the reader to sleep? I’ll try to keep it short, and although it is quite a challenge to condense thirty years of a relationship, I’m up for the task. A mutual friend introduced Bob and I. I remember her words clearly, “Linda, when I’m talking to you, it’s like talking to Bob. You have to go out with him.” So, I did. My remembering skills have lessened as the year pass, but our first date was on St. Patrick’s Day. How could one forget that? Or–how could one forget the moment when we stopped at a traffic light on the way to the restaurant? We were laughing at something one of us said, all I could think was that it had only been two miles and already it felt like this man “got” me. This was a good sign. There was a great deal of laughter in our relationship and a good deal of silliness, but it fit just right. There is one memory that involved a yellow shirt and lots of laughter. Hmmm, perhaps that is the one that I will keep to myself and the two others involved. I know–I’m such a tease. But just hold on a second, I have another one to share. Although the story isn’t as funny, it is endearing. I believe it was after we were married when Bob took a trip to Los Angeles with a friend. I wasn’t able to go, and because he knew how much I loved the beach, this man carried a cup of sand, on a plane, all the way home. That, my friend, is love. Even with the strongest of love the thought of building a business together was not on my radar, or most likely Bob’s. Several years after we were married Bob started a commercial photography studio which he asked me to help launch. I had a few months free, why not? Mind you; I had no experience running a business. I’m not entirely sure how this happened, but within those months clients started calling me rather than Bob. It allowed me to take care of the business side of things, and Bob took care of the creative. Somehow it worked. There were long hours, lots of hard work but I loved working in the studio. We were and are a great team. What now? We were married, building the foundations of our relationship. There were challenges, but we dealt with them, love does that. Bob and I had no idea what was coming our way or that we would need not only love but great emotional strength. Bob’s mother, Lillian, had a recurrence of breast cancer not long after we were married. There are few words to express what happened over the next year; my heart begins to hurt even thinking about it. Lil was a strong woman. Unfortunately, the cancer was stronger. She passed away before our second wedding anniversary. My dear readers, you have been very patient, but it’s time for me to make my point and fast forward to when we were forty-two. Bob wanted to move to New York City. I loved the idea; it sounded like an adventure and one that I wanted to take before I was gray. There was only one problem. My brother had recently passed and had three young children. They were my heart; I couldn’t imagine living away from them. As painful as it was to leave I knew I had to go. We packed up the studio, our home and headed to Brooklyn. To say that it was different would be an enormous understatement. Bob liked to say it was like moving to the moon without oxygen. Never quite knew what that meant but it always sounded right. Eight months after arriving in Brooklyn I was diagnosed with breast cancer. What to write next? Although I have told this story many times, there is a struggle to find words. This moment took my breath away. We were self-employed, rebuilding our business and learning how to navigate life in an urban environment. How would we find a doctor or get the support we both needed? The answer; from our family and friends. We are so fortunate to have such love in our life; this carried us through some of our most challenging moments. There were eighteen months of surgery and harsh treatments, and a short eighteen months later my cancer returned. Odd as it may sound, a pink tutu and a man brave enough to wear it brought a great deal of laughter to our lives. Bob is a photographer, and he began to take photos of himself in the tutu as a means of self-therapy, and a way to cheer me up. Who knew a piece of pink tulle could mean so much? Our life was wound tight from the struggles of metastatic breast cancer. I had to face the possibility that I may die. Bob had to consider that he may lose his wife. How does one live with these words? I wrote a list of my options and came up with these final two choices; I could move forward or give up. Giving up had never been part of my vocabulary. Forward was the motion. Our story and that of the tutu drew worldwide attention. We quickly recognized an opportunity to help others by starting a non-profit to financially and emotionally support those living with breast cancer. Did we know what we were doing? No way. But Bob and I understood the exorbitant cost of this disease and knew we could figure it out. Our medical bills were ridiculously expensive; the stress was wearing on our marriage. We wanted to help alleviate that from others living with a similar diagnosis. We have been fortunate, although we live with cancer daily, my health is stable. Bob continues to create beautiful photographs that bring cheer to many. 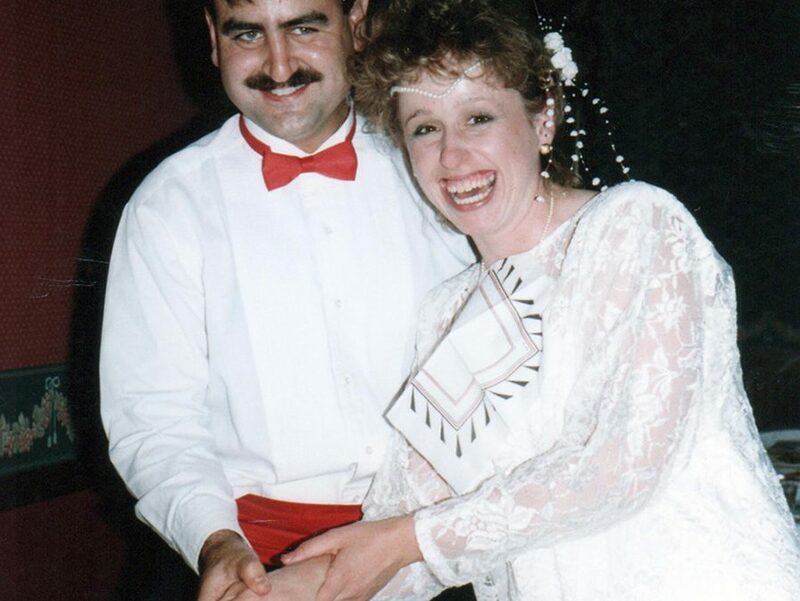 Today is our 30th anniversary, which my lovelies, is no small feat. We continue to live our story which is wound tightly with our joys, our struggles, our successes, our failures and at the end wrapped in our love.